This Psalm, like many chapters of Tehillim, records a prayer composed and recited by David appealing to God to defeat a certain enemy. What distinguishes this prayer from the others is the unusually harsh tone with which David speaks of the threatening foe. He appeals to God to condemn the enemy and have him die young, leaving a widow and young orphans (verses 7-9). David further demands that the deceased enemy's creditors come and seize his entire estate, leaving his family penniless (verse 11). The reason for David's uncharacteristically severe resentment is perhaps found in his description of this enemy and the campaign he wages against David. The enemy disseminates false, incriminating rumors about David and pursues him without any provocation (verses 2-3). Even when David treats him compassionately and shows concern for his well-being, the enemy continues his relentless campaign of hostility (verse 4). David also speaks of his helpless condition, the poverty and hunger he suffered during this period, upon which the enemy capitalized in his attempts to kill him (verses 16, 22-4). This foe has displayed such ruthless cruelty and treated David with such hatred and hostility, that he has lost the right to compassion and kindness. Despite David's generally kind and gentle nature, he petitions God to visit upon this enemy the same kind of malice and brutality that he has shown towards David. To which enemy does David refer in this prayer? 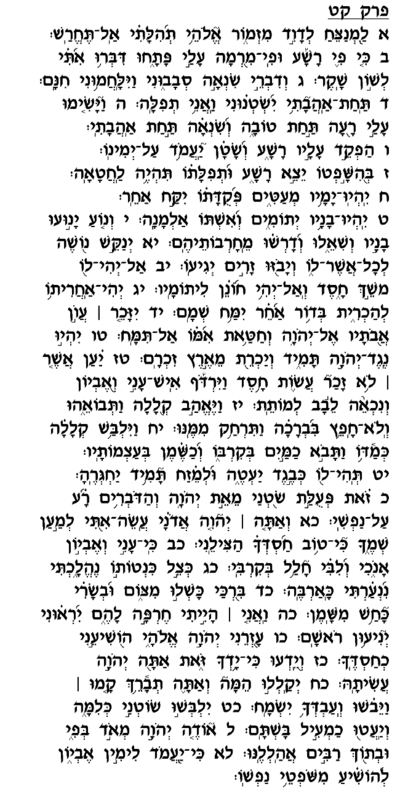 The Radak (verse 1) claims that David speaks here of King Shaul and those among Bene Yisrael who collaborated with Shaul in his pursuit of David. This claim indeed corresponds with David's description of an enemy who pursues him without cause, and with whom he had dealt kindly only to be repaid enmity and hostility. Rashi (verses 1-2), however, maintains that David composed this prayer as a prayer for the entire nation, appealing for assistance against the enemy nation of Yishmael. David foresees the oppression and torment that Am Yisrael would suffer at the hands of the nation of Yishmael, and offers this prayer that God should ultimately defeat Yishmael and bring upon them the same pain and anguish that they had inflicted upon the Jewish people.